Duracell Powermat and Starbucks has announced that they have begun a national rollout of Powermat wireless charging in Starbucks beginning with stores in San Francisco Bay Area. Duracell Powermat and Starbucks has announced that they have begun a national rollout of Powermat wireless charging in Starbucks beginning with stores in San Francisco's Bay Area. The companies will expand Powermat to additional major markets in 2015, with a full national rollout in Starbucks company-operated stores (in US) and Teavana Fine Teas + Tea Bars planned over time. Initial pilots in Europe and Asia are expected within the year. "From WiFi and the in-store Starbucks Digital Network to mobile payment and digital music downloads, we have always tried to anticipate our customers' needs early in the adoption curve and provide a world-class solution. We are thrilled to offer our customers that next level of convenience with Powermat wireless charging. Rather than hunting around for an available power outlet, they can seamlessly charge their device while enjoying their favorite food or beverage offering right in our stores," said Adam Brotman, chief digital officer at Starbucks. "We were pleased with the customer response to the pilot tests, and we're now expanding this offering nationally to provide our customers a quality and reliable experience as they use our stores as their respite, their office away from home or as a gathering place with their friends and family." Stores will be equipped with 'Powermat Spots' - designated areas on tables and counters where customers can place their compatible device and charge wirelessly. Select Starbucks stores in Boston and San Jose offer Powermat today and the broader rollout can be tracked at "Powermat Spots in Starbucks are the result of almost a decade of scientific research spanning material sciences, magnetic induction and mesh networking," said Ran Poliakine, CEO of Powermat Technologies. "The two-pronged power-plug dates back to the era of the horse drawn carriage, so that today's announcement marks the first meaningful upgrade to the way we access power in well over a century." Powermat Spots comply with the open standard set by the PMA – whose members include AT&T, Blackberry, HTC, Huawei, LG, Microsoft, Qualcomm, Samsung, TI and ZTE – resulting in a growing universe of devices and accessories that will charge seamlessly in Starbucks. 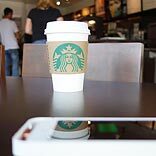 "Starbucks is a highly regarded global brand and its decision to rollout a Powermat network is both empowering and transformative for consumers and the mobile industry as a whole," said Jeff Howard, vice president, Mobile Devices and Accessories, AT&T Mobility. " Many of our newer devices have compatible technology either embedded or available as an added feature to give consumers the freedom to charge wirelessly. Today's announcement marks an important time for our customers – they will have the freedom to stay charged effortlessly in Starbucks stores nationwide over time." "Starbucks is transforming the way consumers get power to their phones, in much the same way it made WiFi a standard amenity in public places. This endeavor is a critical step in Duracell's vision to make dead battery anxiety a thing of the past," said Stassi Anastassov, President of Duracell at Procter & Gamble. "When Starbucks introduced WiFi in their stores in 2001, 95 percent of devices didn't have WiFi, and multiple standards hampered the industry. The rest is history. Starbucks' plans to offer Powermat nationally is likely to settle any lingering standards questions, and usher wireless power into the mainstream."